This is a sleek, medium-sized bird. It is 6″ to 7¼″ long, weighs about 1.1 ounce., and has a wingspan of about 12″. It is a year-round resident of Minnesota. The body is grayish-brown with a yellowish wash on the breast and belly. The wings are pointed, grayish-brown, and have a white inner edge. There are waxy, bright red "drops" at the tips of the secondary wing feathers. The wing tips—the tips of the primary feathers—are dark and do not have any bold markings. The tail is gray, square, somewhat short, and tipped with a bright yellow band. The undertail coverts are white. The neck is short, the head is large, and the bill is short and wide. The head and neck are cinnamon brown. The chin is black and there is a narrow black mask outlined in white. There is a crest that droops over the back of the head. Males and females are mostly alike, but the male has a darker chin. A clear, high-pitched whistle, not ascending or descending in pitch, repeated one to four times; a high-pithed trilled whistle, repeated one to four times. 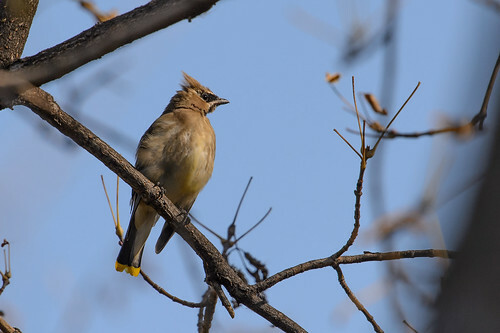 Bohemian Waxwing (Bombycilla garrulus) is slightly larger, up to 8″ long. The undertail coverts are chestnut, not white. The body is brownish-gray without a yellow wash. The inner edge of the wing is not white. The secondary wing feathers have white tips, which appears as a white patch above the red "drops". The wing tips have bold yellow and white markings. They are found in Minnesota only in the winter. Mostly fruits; in the summer also eats flying insects. The Breeding season is June through August, usually one brood in the spring and a second brood in the summer. The female builds the first nest in about five days by weaving together twigs, grasses, moss, and lichens, then lining the interior with soft grasses. The finished nest is cup shaped, about 5″ in diameter, and about 3″ high. The female lays 2 to 6 (usually 4 or 5) eggs which hatch after 11 to 13 days. The hatchlings stay in the nest 14 to 18 days. Small feathers on the wings and tail of a bird that cover other feathers and help smooth airflow during flight. Here is a Cedar Waxwing feeding on Splendid Crab apples. 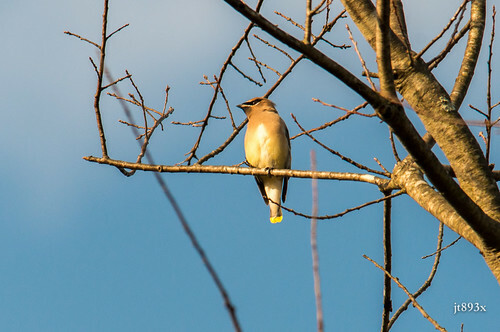 The Cedar Waxwing (Bombycilla cedrorum) is a member of the family Bombycillidae or waxwing family of passerine birds. It breeds in open wooded areas in North America, principally southern Canada and the northern United States. 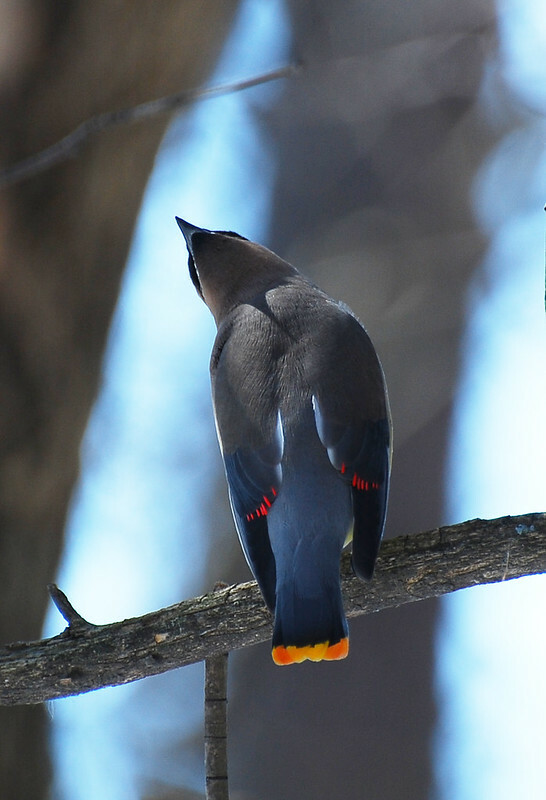 Outside the Breeding season, Cedar Waxwings often feed in large flocks numbering hundreds of birds. This species is irruptive, with erratic winter movements, though most of the population migrates farther south into the United States and beyond, sometimes reaching as far as northern South America. They will move in huge numbers if berry supplies are low. Rare vagrants have reached western Europe, and there are two recorded occurrences of Cedar Waxwing sightings in Great Britain. Individual Bohemian Waxwings will occasionally join large winter flocks of Cedar Waxwings. In winter, these birds can be very confident and will come into gardens for berry bushes and trees and to drink from fountains or bird baths. Corto sobre las aves migratorias Bombycilla cedrorum conocidas como chinitos o ampelis americanos, que vienen a México desde Canadá y EUA. 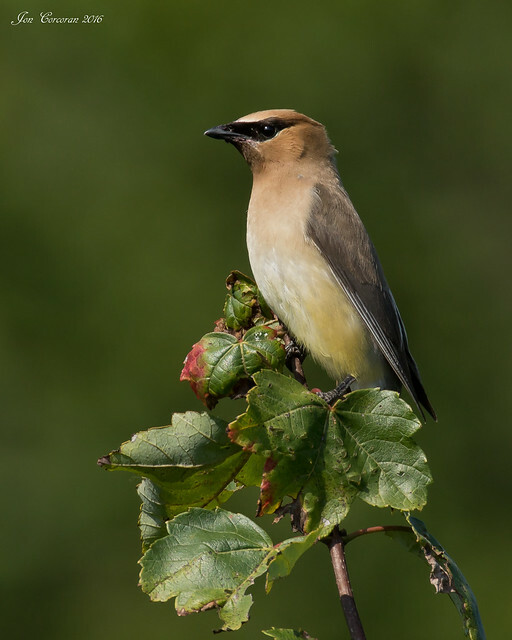 Cedar Waxwings have been observed to pass blossoms, berries and other food items to potential mates as a courtship ritual. lived here 30 years, first sighting. Drank from 3 different fountains in backyard.